An idiom is a word or phrase with a meaning that is different from the actual words. 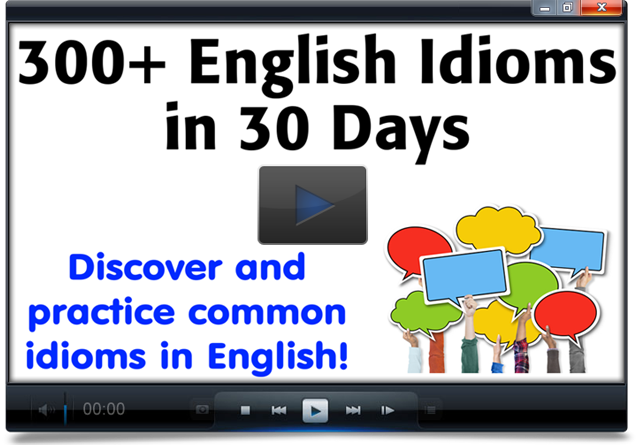 Read the example sentences in the quiz and then choose the best answer for the meaning of each idiom. Good luck! Kristen has a short fuse. Yesterday she yelled at me for an hour just because I didn't answer her phone call right away! I can't carry all these books. Can you lend me a hand? In this specific case, the speaker is asking a friend to carry the books. However, "lend a hand" means "to help" in general - maybe with carrying, maybe with building, maybe with assembling a computer, etc. My brother-in-law and I don't see eye to eye on politics. He believes in a big government with lots of laws, and I support less government interference in citizens' lives. Richard broke the living room window while he was playing ball inside the house. He's going to be in hot water when his mother comes home! I'm giving a presentation to 500 people at the conference next month. I already have butterflies in my stomach! "I can eat an entire pizza by myself." "I don't believe it! Put your money where your mouth is!" My girlfriend took me to a dance class, even though I've never danced in my life. I felt like a fish out of water. I use Facebook and Skype to keep in touch with my relatives who live in another country. Bob loves his iPhone; he has it with him 24/7. 24 hours per day, 7 days per week = all the time, constantly! "Do you like to ski?" "I do, but I only go once in a blue moon because it's so expensive."